Alex: It’s easy to be allured by the copper furnishings, marble table tops and open plan space of The Resident in Darlinghurst. After seeing it on Broadsheet a few weeks backs I knew it was one that Team FFS had to jump on quickly. The food is designed around shared plates with influence from Spain and the wider Mediterranean regions. Chef Pablo Tordesillas who is known from acclaimed Brisbane restaurant Ortiga pioneers the restaurant and has created a rather intriguing menu with dishes that I’m almost near certain that some have never even heard of. Seriously though, if the furnishings are not enough to get you to check out the restaurant than you might as well just turn away now…Don’t you dare though, you keep reading. The regular wooden cafe style chairs have been given a face-lift with some beautiful leather as back support. The contemporary and stylish fit out is elevated by wooden tones contrasted with marble and copper finishing that have made for the most appealing dining experience and make you feel like you’re sitting in utter luxury. We started off with the team’s fave part of the meal. The House made organic sourdough bread, garlic & porcini butter $3pp. An interesting combination of flavours. The bread was fairly soft with a lovely crunchy exterior with the butter giving off some lovely earthy tones. Vanessa wasn’t too keen on it but myself and Bianca thoroughly enjoyed it as well as the slightly thicker, whipped texture. We did however think that $3 per person for one slice of bread was rather ludicrous. The Croqueta $4 each were filled with hot stringy cheese so there’s no reason why these wouldn’t be great unless you didn’t like cheese…which is sacrilegious. To sample, we ordered one of the jamón ibérico, coca puffs $5 each. I feel like this is always a winner as long as the product is sourced well. The jamón is a constant reminder for me of walking through La Boqueria Markets in Barcelona. However, I didn’t even notice any of the coca puffs. For a dish that generally isn’t all that exciting the broccoli, capers, colatura, chilli & egg $16 turned out to be something quite interesting. Kudos to the team for being able to dress it up so well. The egg and bread ‘croutons’ were definite stand outs. I also liked that the broccoli had a bit of bite to it. This dish in particular is great for the photo op. After eating some pretty great octopus around Croatia and Montenagro I’ve sort of become an addict so the W.A. octopus, ago blanco, sumac and grapes $29 was a must order. I was not expecting it to come out as one whole tentacle which for some can be a little daunting. I think at first most of us were avoiding the thicker part but in fairness it was just as tender and flavoursome as the thinner part. I did feel as though it was slightly OCD with the salt. More than a few bites and I think it would’ve become a bit sickly so thankfully the whole menu is designed on sharing! Oh and on a side note I loved the yoghurt sauce that accompanied the dish. Probably the highlight of our savoury dishes was the Cooroong angus skirt, parsley salad $30. Our waiter/somelier had commented that some people don’t know how to take the texture of this particular dish as it’s quite slimy but I liked it. It was if it had been dusted in flour and pan fried giving it that really thick texture. The steak itself was very tender with a beautifully rich flavour that balanced well with the radicchio salad. The Radicchio, orange & caramelised chestnuts $17 was beautifully presented. Vibrant colours contrasted so beautifully against the marble table. The blood orange added a sweetness to the dish that counteracted the bitter taste of the radicchio. The chestnuts were scantily scattered over the salad and if you were lucky to find one it added a great textural element to the dish. Feeling as though we needed to order more than one dessert we went with the Rum baba, quince, almond cream and lemon balm $14. Unfortunately this one just left us blank. There was no distinct flavour and nothing that would entice me to order this again. Doesn’t sound like much on paper but when we were brought the Spaghetti pumpkin milhojas, creme & pepitas $15 I think it was a stand still moment and there were a few ooohs and ahhhs …Okay maybe not out loud but we were all thinking it. Think of a pumpkin pie but better. 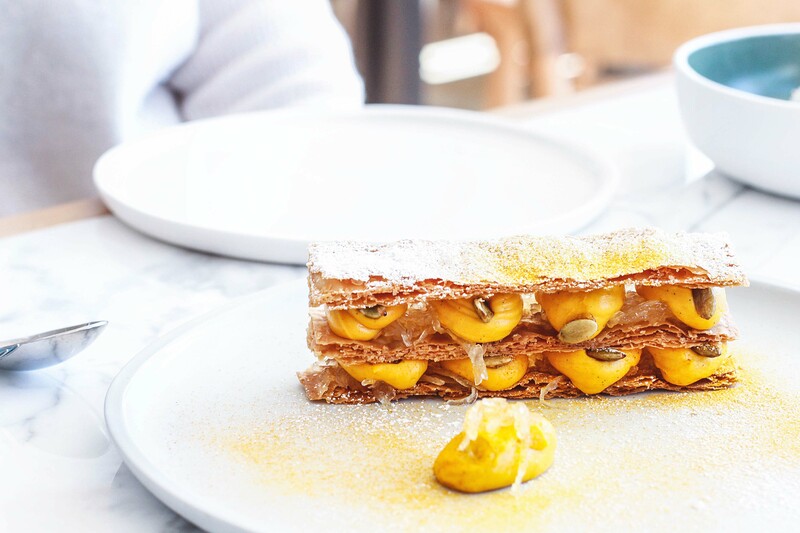 Thin little slices of spaghetti were discreetly layered underneath the mille feuille that reminded us of one of our Nonna’s oldest recipes, Pastia with cinnamon and vanilla. Each bite was full of flavour with an array of textures and sweetness. This one is a must order. Perhaps a little pricey for your standard long lunch but if you’re wanting to splurge and try something different then this is definitely the place to do it. It’s still new so there is a few kinks in the menu that could do with some adjusting but with unobtrusive service, a comfortable atmosphere and wonderful view I’d happily go back…and in fact I will be to go and try out the cafe that is attached next door!